The land on Selkirk's south common, where the new storage tank will be installed. With the Manse Street water treatment works in Galashiels nearing the end of its serviceable life, plans have been put in place for a massive new water storage tank on the outskirts of Selkirk. Map showing the pipeline route and where the water will go. 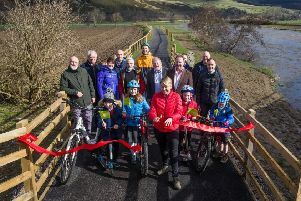 This, as well as a new seven-mile pipeline from there to Galashiels, is expected to deliver a more resilient supply to more than 20,000 households in nearby towns and villages, including Melrose, Lauder, Fountainhall and Newtown. New treatment processes will also be installed at the Howden water treatment works near Selkirk and the facility in Galashiels will be converted into a service reservoir. First to be tackled is the new pipeline, which will carry up to 5 million litres of treated water every day. Work will begin laying the pipeline next month. While the proposed pipeline only crosses the A7 at two points, there will be some delays during the installation, but Scottish Water’s corporate affairs officer Adam Warner told us that the company will do what they can to minimise disruption to drivers. He said: “There are only two crossing points. The first one will take eight weeks, and there will be temporary traffic lights installed, which will be manned during peak hours to ensure the least possible disruption. “The second crossing, near where the Ettrick and Tweed meet, will only take a few days. The pipeline will also need to cross burns and rivers. Scottish Water says these water crossings will be carefully managed to reduce any possible environmental impacts. Mr Warner also said the new 12 million litre tank – the size of a rugby pitch – to the south of Selkirk, shouldn’t make too much of an impact on the surrounding countryside. He said: “It will go into the side of the hillside above the layby just to the south of the town and it will be sunk into the hillside, landscaped and screened. “The water will be coming from the Howden water treatment works, which will be upgraded. “Part of these works will include the installation of new filters at the site, which will force up to 14 million litres a day through 0.4 micrometre wide straws – 25 times narrower than the thickness of cling film. Mr Warner added that the closure of the Galashiels facility – located close to the town’s cricket club – in 2020 will also help to improve flows in the Caddon Water during dry summer periods. Mark Dickson, Scottish Water’s director of capital investment, said: “This work to improve the water supply for the Selkirk and Galalshiels area of the Borders will ensure we can continue to supply high-quality water in the area long into the future. Borders MSP Christine Grahame told us: “I am pleased to see Scottish Water’s announcement of an upgrade to the water services in the Borders. “This is a significant investment which will bring long-lasting benefits to my constituents – including a better quality of water, greater supply capacity, and environmental benefits.